The rebels told to march on Tripoli by their leader Khalifa Haftar, said they had been targeted by an air strike. Tripoli is the home of Libya’s internationally recognised government, which has the backing of the UN. Fighting has been reported near the former international airport, which the LNA claims now to control. The secretary general of the United Nations held talks with offensive leader Khalifa Haftar on Friday but left the country without achieving a breakthrough. On Friday the LNA briefly seized the airport before being pushed out. They also briefly seized a checkpoint to the west of Tripoli but were again driven back. Armed groups allied to the Tripoli government told Reuters on Friday that they had taken a number of LNA fighters prisoner. 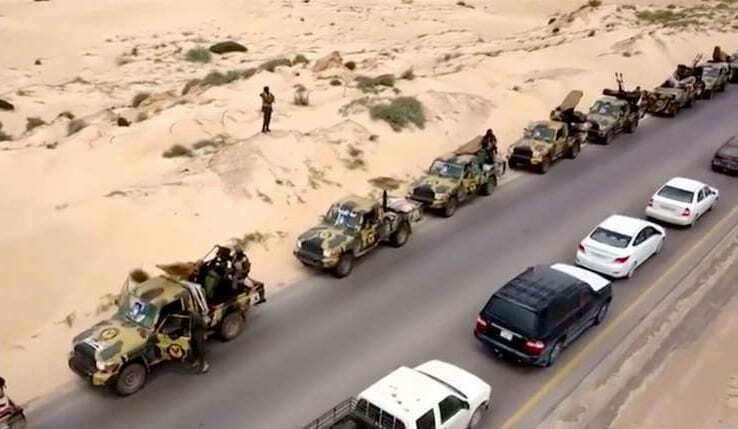 As Haftar’s forces advanced on Friday, G7 foreign ministers said that they were strongly opposed to military action in Libya and implicitly warned the eastern Libyan commander against continuing his advance on the capital. “We firmly believe that there is no military solution to the Libyan conflict,” the foreign ministers from France, Britain, Germany, United States, Italy, Japan and Canada said in a statement.